1. take the advice of your wise friend who coaches you on how to mesmerize a crowd; he knows what he's talking about. 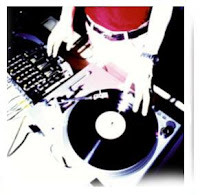 2. never trust a DJ who has only one ABBA song. 3. if that shower curtain in the hotel room keeps blowing in and wrapping itself around you, every shower will be like showering inside a sleeping bag. 4. when you dance with your brother in law to the only Weakerthans' song the DJ has and it's One Great City and your brother in law used to be a high school English teacher, you just know you will end up lamenting to each other that people just don't understand irony. 5. people with mullets can be really nice, even if they do only like country music. 6. the right outfit, preferably one with a swingy skirt that snaps when you move, can help you overcome your white girl tendencies and dance like you're alone in the kitchen. Apparently it's my four year blogoversary. Did you even bring a present? I'm keeping track, you know. Tomorrow marks the beginning of the High Holy Days of the year. Calgary Folk Festival. In fact, I was down at Prince's Island tonight, paying pilgrimage and cleansing my soul in preparation. Actually it was the Record Tent meeting. The buzz is palpable around the place, stages are set up, tents are erected, vendors are moving in, porta potties are being lined up and having their little soap dispensers filled. Although there appear to be a lot of new people working the Record Tent this year, I was thrilled to see quite a few of the regulars returning. Even though we only see each other for four days a year, it's always a joy to see one another again. Big hugs and back slaps break out all over the place. I love working with these people, because we all really want to be there and we love what we do. Tomorrow at noon, I start my volunteer duties. So once again, I am going to be negligent in visiting you, but I will return and I will bring curry or music or something. Also detailed daily reports from the Island. Be nice to each other. You know I'll find out if you're not. there are still people with mullets? 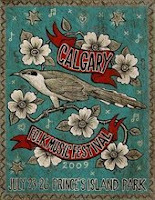 Have a great time at the Folk Fest. Look forward to stories upon your return. I've got my popcorn ready! What is it with those hotel shower curtains, eh? You're so right! It does feel like you're showering in a sleeping bag! So wish I could go to Folk Fest, and see my heroine, Loreena...Have a great time! Four years. One for each strong wind. Happy blogoversary. Somebody should explain to mullet wearers that it's perfectly fine to listen to country music without looking like an extra in a bad hockey movie. Mr. Samson writes the sort of lyrics that have to be puzzled over. It's hard for people to catch on during the first listen, especially if they are distracted. Just think of all the references he tossed into a song like Over Retired Explorer. Anyways, have fun at the fest. Oops. I forgot. Congrats on the blogoversary. There are in Brandon, apparently, Mr Anchovy. And I don't think it was an ironic mullet either. Ah yes, ABBA, the great divider. It is only my extreme fondness for you that allows me to overlook your irrational ABBA hatred, Al. I've got a bone to pick with Loreena McKennitt,Wandering Coyote. Not her music but the fact that I had to haul her excessive shipment of cds and dvds around all over the place today. The great Alberta tradition, John, referencing Ian Tyson at every opportunity. Someone really should explain that to mullet users, Remi, you are right. I nominate you, since you have already done so so eloquently. True story about the Weakerthans' lyrics and yes, you get an entire history lesson and then some in Our Retire Explorer. It's been fun so far, Gifted. I hope you have a magnificent celebration of your materialization! Happy Blogervesary! And unfortunately I do not get the Weakerthans/high school English teacher irnoy. Allthough I would dearly like to be able to get it. I think you have to be at least partly Canadian, if not a downright Winnipeger, to get the irony of the Weakerthans, BAP, and I know you are trying hard to make that happen, so give it time. Well, the nerve! I'm so sorry she put you out! But that's what you signed up for right? Right? Have a great weekend, I'll be thinking of you - and playing Loreena on my MP3 player!!! I brought a present, it's wrapped in this shower curtain. I don't trust DJs that have more than one Meatloaf song. It means they're lazy. Happy Blogoversary to you, you most gracious and kind blogger lady ever. (Seldom am I deemed wise, but take that I will.) I shall hold my head proud today. I need to know though, just what do you buy for a Blogoversary? Hey Barb, happy to hear that you've recovered from the wedding and the hotel enough to give the Folk Fest your best shot. We regret missing the Wpg. Fest this year; we did have to make a really difficult choice, but then daughters don't get married that often. You're still getting rave reviews for the marriage officiating; another career option? We'll have to continue that irony discussion. Given the state of Winnipeg lately, the Weakerthans may have been speaking literally after all. I thought of you every time I cursed her this weekend, Wandering Coyote. I kid, she gave a great performance, which sadly I couldn't attend, as I was working, but I could hear from inside the record tent. Everything comes wrapped in shower curtains these days, JustA, it's the new black. I firmly believe that Winnipeg remains the mullet capital of the western world, SME. I hope your neck isn't getting stiff from holding your head too proudly, Sean. And for blogoversaries, it's tradition to buy the blogger a couple of drinks and take them out to a concert. Shall I take a rain cheque on that, then? The family sends a hug back, Bryan. You certainly didn't want to risk showing up to your daughter's wedding with a random folk fest injury, so foregoing it was prudent. I am nursing a couple of those today myself.